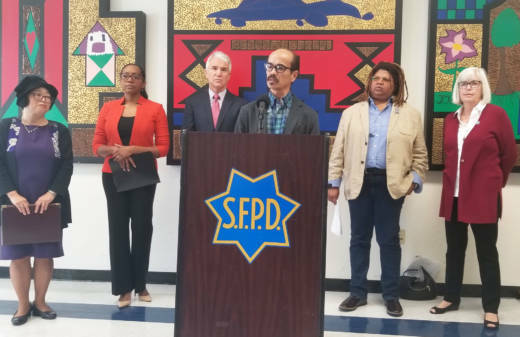 The city of San Francisco is expanding a domestic violence prevention program in the Bayview neighborhood, with a particular emphasis on reaching Asian and Pacific Islander communities, which are believed to under-report family violence. Asian and Pacific Islander-Americans constitute over 30 percent of the Bayview's population, but they only represented 8 percent of domestic violence reports made to San Francisco police between June 2017 and June 2018, said Emily Murase, director of the San Francisco Department on the Status of Women. "We know it's underreported," she said. "Victim survivors are not availing themselves of the services at the rates they should be." Reaching diverse communities is a very important aspect of combating domestic violence in San Francisco, according to Amor Santiago, executive director of APA Family Support Services, an Asian and Pacific Islander community organization that is one of the partners in the new initiative. Santiago said it can be hard for people in immigrant communities to come forward about domestic violence, often because of language barriers. To address this issue, APA Family Support Services' workers speak Hmong, Cambodian, Thai and Chinese, among others. According to Santiago, cultural norms also prevent women from seeking services. "There's this idea for a lot of people that this behavior stays within the family," he said. However, Santiago said a lot of the Asian and Pacific Islander community — almost 40 percent — use other types of family services. So with this new funding, his organization can encourage women who are already receiving other services to come forward about domestic abuse in a culturally sensitive way. "When we reach out, we don't say, 'we see you as a victim,'" he said. "We say 'we support you,' and in that relationship of trust, speaking the language, coming from the culture, it makes it easier for someone to open up about something else happening in the family dynamic." The $750,000 in funding for this new three-year program comes from the U.S. Office on Violence Against Women, and is a funding extension of another initiative in the Bayview, piloted this past year, to screen domestic violence victims to assess their risk and help connect them to services. 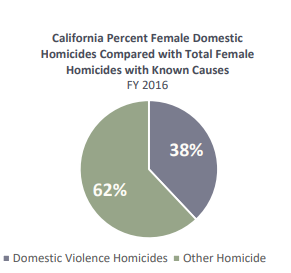 The Bayview Domestic Violence High Risk Program uses identified risk factors in domestic violence cases to determine whether or not a victim is at risk of being killed by their partner. If the survey suggests a victim is at risk, police officers connect that person to local organizations, such as La Casa de las Madres, which provides victims with counseling, advocacy, legal assistance and shelter. After a year of piloting the program, San Francisco Police Captain Steve Ford said over 50 percent of victims screened as "high risk" and 84 percent accessed further services. "If they access those resources, it greatly diminishes the probability that they will become victims of serious injury or, more importantly, death," Ford said. San Francisco community-based agencies served over 21,200 domestic violence victims between July 2015 and June 2016, as well as over 18,200 calls to community-based agencies domestic violence crisis lines, according to the latest Family Violence in San Francisco Report. The report also found that people of color are disproportionately affected by domestic violence. 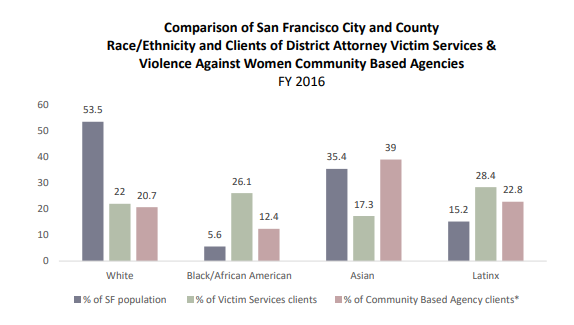 For example, despite comprising less than 6 percent of San Francisco's population, African-American victims account for over 12 percent of clients served by community agencies and 26 percent of the victims supported by the district attorney's Victim Services Division. Latinx victims account for 15 percent of San Francisco's population and 28 percent of the DA's Victim Services Division. 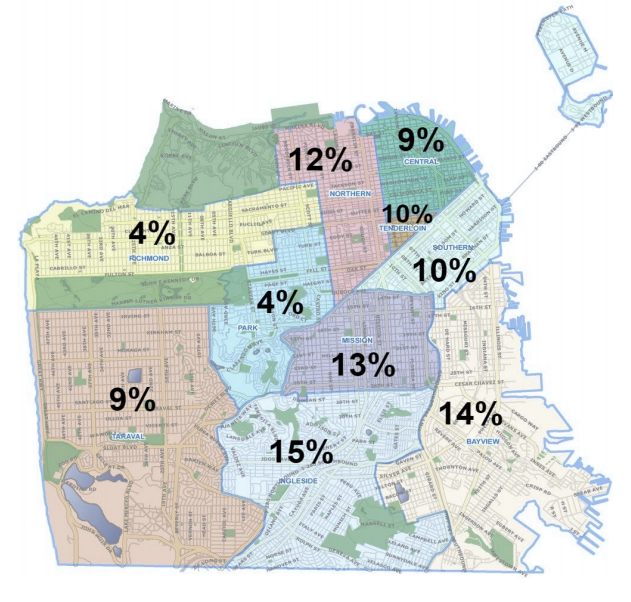 Proponents of the new Bayview initiative say it can be a blueprint for the rest of the city, particularly helping to reach diverse communities who are under-represented in the system. "What we need is to elevate the non-profit organizations that are embedded in the community," said Andrea Shorter of the Commission on the Status of Women. "They have the language, they have the cultural competency." The federal funding for the new Bayview program is a direct consequence of the Violence Against Women Act, originally passed by congress in 1994 and set to lapse this coming December, pending re-authorization. Shorter says the Bayview initiative is one of many examples of why this federal legislation is so important. "Domestic violence remains a hidden epidemic," said Shorter, who also said the federal funding has been crucial. "Collaboration is what is needed to wrap our city arms around survivors and hold them safe."